develop in autumn. Fantastic in containers with a lovely cascading habit, but equally as good in a shady border on on the edge of woodland. 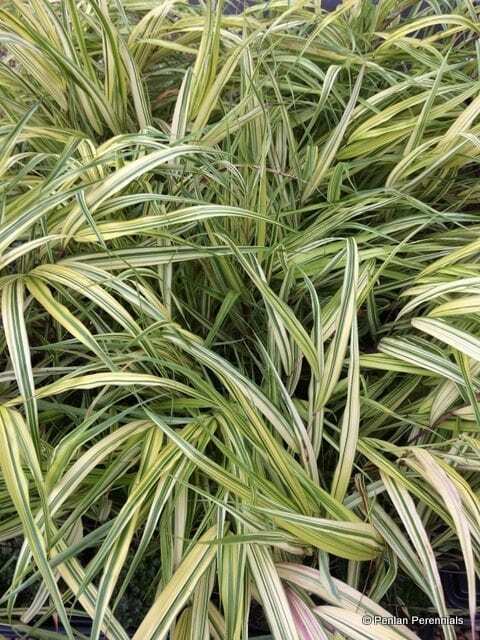 Remains fairly evergreen and enjoys a moist soil. If placed in a sunny spot the leaves will go a much brighter yellow and may burn. Originally found on the island of Honshu, Japan. Lovely for variegation in a shady spot. The flowers are insignificant and best removed. Hardiness H7. Pot size 1.5 litre. Cut to the ground in spring, which is also th best time to divide established clumps. Cut stems can be composted or used as a mulch.